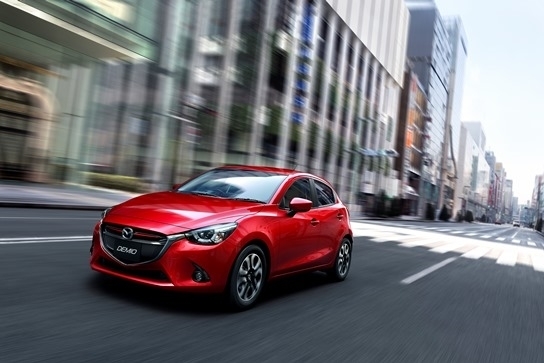 This is the impressive new supermini, the Mazda2, which should shake-up the segment when it is launched in the autumn. There isn't much information about the new vehicle at the moment but it is likely to impress and will build on previous successful models which were great cars to drive. They will come with the firm's ultra-efficient Skyactiv engines which will deliver impressive levels of fuel economy and performance. There's no doubt too that the Mazda 2 will also be a fun car to drive; the previous incarnations were comfortable, well made and offered an enjoyable drive. The car making skills of Mazda are in no doubt and the new model will line-up alongside its impressive current offerings of the Mazda6, which deserves to be more commercially successful, and the excellent Mazda3. Indeed, Mazda has high hopes for its new Mazda2 as it enters the biggest market in Europe, the crucial 'B' segment, and it's likely to win over a new band of fans. Alongside the excellent petrol and diesel engines there's also the Skyactiv body and chassis. Mazda says that the new vehicle will also come with its innovative in connectivity system, called MZD Connect, along with a range of class beating active safety technologies called i-Activsense. It also goes without saying that the new Mazda2 will have an interior that is not only spacious for its size but is also highly refined and a comfortable place to be. The new car has a big act to follow, since its launch in 1996, more than 2.4 million customers have snapped up the Mazda2 around the world. The car has been successful for a number of reasons, mainly for its reliability and outstanding value for money. So there's no doubt that the new Mazda2 will be writing a new chapter for this carmaker who make impressive and reliable cars. Of its rivals, probably those behind the Ford Fiesta are looking nervously over their shoulder, particularly for the excellent Fiesta ST since the Mazda2 is likely to be a very sporty performer indeed.